There is some sense in which every single road in the Old Testament leads to the Blessed Eucharist — to the tabernacle. We read most of the Book of Exodus today. It might be said that all it was was an “exodus” out of the desert and into the sanctuary — into the presence of Jesus Christ. I genuflected, in my mind, at the end of our reading, because there was Our Lord! No group of people in the world were so careful as the Jews to observe the prohibition against idolatry and the adoring of a graven image, of a thing made by hands, an object set up to be an idol in the place of God. The pagan nations had obelisks and sphinxes and pyramids, but the Jews — never! The Jews had a terrible sense of holiness. They were very careful to keep their adoration, their bowed head, their liturgy of God the Father’s love, away from anything that was not sheer God. And yet we know there was one thing to which they gave the profoundest and most abject respect and veneration. Nothing in the way of holy protection or liturgical anticipation could exceed the sacrosanct reverence which they gave it. They put it not merely in the Temple — in the Men’s Court, the Women’s Court, or the Levite’s Court. They put it in the Holy of Holies, where only the High Priest could enter. I speak of the Ark of the Covenant; the great Ark of the Covenant of the Old Testament. The Ark was a box which contained the two Tablets of stone on which God had engraved the Commandments given to Moses. Were you to put in the Holy of Holies one thing that would abide as presence — majoring in being present and being able to be kept present — it certainly would be stone, engraved and guarded, watched and prayed before continually. Of all the things in the Old Testament that could be said to be permanently abiding in “real presence,” these two Tables of the Law in the Ark of the Covenant certainly could. And they were real, to this extent: The writing on the Tablets of stone was God’s writing. These Tablets had been engraved above the clouds. In them, the Jews did not have God’s Self, God’s Substance, but they did have God’s thought — carved in stone! No one could fail to feel that that was trembling very close to the Real Presence of God Himself in adoration; that that was awfully close to the real thing! Two stone Tables of the Law, straight from God. You know how you take a letter from a friend and press it to your heart, and make it substitute for presence? Well, that is what the Jews did, in a way. There was something beautiful in the Jews of the Old Testament, to venerate these Tablets in abiding presence. Let me give you another point. The Jews were, as you will re member, fed from above by God. Now, when you just stood in a field which you never had tilled, or plowed, or sown, and sustenance came to you — your food fell down upon you from the sky. I think you could say that that was indeed communion (with a small c), could you not? That was very close almost to eating the substance of God. Is that not true? We know also, about this “manna” that was dropped from heaven, that it was the most unabiding thing that could be! It never lasted a day. They had to have a fresh rain of manna every day. (None came on the Sabbath.) Though you could cook it and eat it, the sun shining on it would wilt it. As a tribute to the fact that these were the types of the Blessed Eucharist — one, in presence, a type of the Real-Presence-to-be; and the other, in communion, a type of the Holy-Communion-to-be — it was the requirement that a chalice or ciborium of the manna be kept in the Ark, alongside the stone Tablets. Now, this manna, the manna kept in the ciborium in the Ark, was miraculously preserved! This manna did not fade at night, as did the other manna which rained down from heaven every day. One other thing was placed in the Ark of the Covenant — the rod of Aaron. The rod of Aaron was a type, too — a type of the priesthood. Do you see your Mass getting ready in the Book of Exodus? The Jews had to carry the Ark of the Covenant everywhere. David bore it in triumph; Solomon built a temple for it. The Ark was made of setim wood, the most precious and incorruptible of all woods, and it was lined on the inside with pure gold. It had four rings, with which to carry it. They put a pole through two rings, and another pole through the other two, and even when the Ark was not being carried, the poles were left resting on it. The Ark was surmounted by two beautiful cherubim — knowledge angels — surrendering their angelic minds to the wonder of this covenant and type! And before the Ark, in the Holy Place, there were kept: a seven-branched candlestick, the altar of incense, and the loaves of proposition. How do you like that? Presence and food and priesthood, inside; and candles and incense and bread, outside! Do you see God’s Last Supper beginning to gather? Do you see the world being plucked of its ingredients, and the Bread of Life being forged for us? If you do not believe in the Blessed Eucharist, the Book of Exodus means nothing, I assure you! Try reading it! If you do not believe that the greatest gift God ever gave us was His Flesh and Blood to eat, the great central mystery of Christianity has escaped you. If you think that the Apostles at the Last Supper got Jesus wrong on the Blessed Eucharist, and the crazy Modernists got Him right, what does Christianity mean? We stand or crash, rise or fall, with this Reality! When you say to a man, “Do you believe in the Body, Blood. Soul and Divinity of Jesus Christ in the Blessed Eucharist?” and he says, “No,” you should know that you are not speaking to a Christian. Many Anglicans, may I say, have told me that they believe in the Real Presence of Jesus in the Blessed Eucharist. Now, you figure that out for yourselves! Do they? No, they certainly do not! Imagine believing in the Holy Eucharist, and not keeping It under the guardianship of our Holy Father the Pope, in the Catholic Church! A student from the Episcopal Theological School, here in Cambridge, came to see me not long ago. “I think I believe in the Blessed Eucharist,” he said. And he went right on staying in the Anglican Church! Can you imagine really and truly believing the Blessed Eucharist is God, and not being overcome at the wickedness of a heretical church which could for so many centuries keep It from its people? I told this boy that he was dishonest and a fraud, and I have letters from him admitting it! Our Liberal Catholic priests who are going around talking the wrong way to Protestants, cooing to them instead of giving them the strong, straight challenge of the Faith, are keeping them away from the Bread of Life! The Blessed Eucharist is dynamite to a priest’s heart — what It is, where It is kept, and how It is guarded! If priests of the Old Law could guard with all the sanctity of the priesthood the stones God wrote on — which were not God — and the food dropped down from heaven — which was not God’s substance — what do you think we Catholic priests ought to be guarding in our sermons and our talks? Interfaith “charity”? What we have in common with Jewish rabbis and Episcopalian doubters? Imagine how God will punish His priests in our day! He is beginning the punishment, as a matter of fact, right before our eyes. We read today that ten thousand priests and nuns have been kicked out of their religious houses, back into lay life, in Hungary. And, as far as we could find out, there was not one martyrdom among them. Imagine that! Not one priest stood at his altar and let those dogs kill him! Kill him for the sake of Jesus, in the Blessed Eucharist! The old rabbis guarded the Ark of the Covenant better than our priests are guarding our Holy of Holies. Well, I am getting ahead of my story. However, I do not mind if you know the indignation and worry and sorrow in my heart. You will remember that I spoke to you last week about the Real Presence in the Blessed Eucharist? Let me discuss that again for a few moments. The priest says, in Jesus’ name, “This is My Body.” At those words, the Eucharistic presence of Jesus, His Body (and, since they can never again be separated, His Blood, Soul and Divinity) replaces the substance of the bread. An astounding thing has taken place, and the priest for all the rest of the Holy Sacrifice of the Mass, speaks of the “Corpus” — the “Body” of Jesus. The astounding thing which has taken place is not — as of late I have heard it explained — that “the same God Who is in the mountains, the skies, the oceans and the forests, is here on the altar.” To all those things, as I brought out last week, God is present by His omnipresence. The astounding thing is that here, on the altar, is really the Body of Jesus. The eyes of Mary’s Child, the heartbeat of Mary’s Child, the hands and feet of Mary’s Child, are here! Get that, and the rest is safe. Get that, and you will have the Faith. Get that, and you will love God. Get that, and you will be capable of making that “act of perfect love” which our Liberal clergy think it is so easy for those outside the Church to make — and which we at Saint Benedict Center believe it is absurd to ask them to elicit. (And can you not see why?) Get that, and you will be ready to die for Jesus Christ. What is transubstantiation? It is the dignity and transcendent majesty of Being’s own Self, telling a created thing to move over — to push out — while It moves in, on Its own terms! The substance of the bread entirely ceases to be, and Jesus takes its place. You could, my dear listeners, have transubstantiation of any substance into the Body and Blood of Jesus, if God had willed it. Jesus could have taken up a stone, and said, “This is My Body.” That would mean that the species of the stone would be left, but the substance would be the Substance of the Body of Our Lord and Saviour, Jesus Christ. But, as Jesus said: “What man is there among you, who, if his son asks him for bread, will he give him a stone?” How much more will not Our Eternal Father? It could be, however. What would you then have on the altar? You would have Jesus, literally adorable, and seeming to be a tablet of stone — not which God engraved with His writing, but which He substantiated with His own Presence. Would it be adorable? It would. Would it be Real Presence? It would be Real Presence. It would be something you could pick up as real, something you could carry or put down. Would it be a communion? It would not. Why? Because God would not be present there in the guise of food. Food is communion before it is Holy Communion. That is all that bread is meant to be before Holy Communion — communion with man. Food communicates itself, imparts itself, to man, and man assimilates it. Man takes food into himself, turns it into energy, and sustains his life by it. We say he turns the food into himself; it becomes part of him. Do you see now the difference between the Real Presence and Holy Communion, even though the same Divine Lord is present in each mystery? As I told you, the beautiful, central, devotional mystery of the Catholic Faith is the Blessed Eucharist. Now, with regard to an Object so sacrosanct, so precious, so adorable, so dear, we would never change our terminology and lightly call it “Real Presence,” “Blessed Sacrament,” “Holy Communion,” or “the Sacrifice of the Mass,” unless there were in this Sacred Thing values that warranted this change in terminology. Otherwise, we would be trifling with the truth. That would not be holy. As words go, “sacrifice” and “communion” do not mean the same thing. They are, as words, greatly different. If God puts Himself — transubstantiates Himself — into the place of a communion, a food, then that Food is the Real Presence and Holy Communion. It is the Real Presence because God is there, and It is Holy Communion because It is there under the species of a communion entity — of an eatable entity. Under the whiteness and lightness and the assimilability of bread, our Holy of Holies moves in. Our Holy of Holies is more than the Tables of the Law and the manna, together! Our Holy of Holies is more than the Tables of the Law in that It is the Word of God in truth — not merely in writing. It is more than the manna in that It is the Substance of God in food — not merely an abounding gift of food from heaven. The Real Presence in the Blessed Eucharist is the Body, Blood, Soul and Divinity of Our Lord and Saviour, Jesus Christ, in the tabernacle. I can now kneel before the tabernacle and acknowledge God. I can give Him not merely the adoration of my spirit — which could reach Him somehow in eternity and beyond time — but I can give Him the adoration and love of my body, of my hands, my blood, my heart, my knees, my breast, my silence. my closed mouth and rapt attention. My eyes can shut and adore, because I am in the Real Presence of something in my own kind. Flesh and Blood are here — so flesh and blood can adore! Think of all the lovely joys and wonders of Divine Love, for a heart of good will. Nobody could fail to be impressed in a Catholic church, as much by the material adoration as by the spiritual adoration. What goes on in the realm of the spirit there, we do not always know. But there is a moment in the Catholic Church when everyone knows what is going on, both in the spirit and in the flesh. It is the beautiful, impressive moment in the Mass, when every movement and every sound are stilled, the whole congregation hushed, a little boy rings a bell, and all heads are bowed. It is the solemn moment of Consecration. The fact that heretics and infidels, atheists and doubters, go by that Catholic church by the hundreds, and never pay any attention to it, shows that they are not men of good will. Nowhere in the world is a challenge given which is so sheer, and clear, and imperative, and strong, and unduckable, as the challenge of the Catholic Church. It is the wonder of the world, and the only thing which men of bad will can do is to avoid it — to smile it off, or compromise on some other score! Will they be lost? Yes, they will be lost. Imagine Harvard students in Adams House not being able to find the Body, Blood, Soul and Divinity of Jesus Christ, fifty yards across the street, in Saint Paul’s Church! The Real Presence, then, is God to go to and adore. The Sacrifice of the Mass is God to give to God. Nothing we have to give of ourselves is worthy of God. Only God is worthy of God. In the Holy Sacrifice of the Mass, we have, not a paschal lamb, but the true Lamb of God! We have Jesus Christ, the Second Person of the Blessed Trinity, true God,— to give to God! The priest who stood and confessed, at the beginning of the Mass, to the Blessed Mary ever Virgin, to the saints, and to all the people, that he was unworthy (and was encouraged to think of himself as a sinner by the altar boy, who is also a sinner) is now, in the giving of God to God, worthy of the respect of the angels! He is giving a Gift no one on earth, except a priest, can give. He is Aaron. And that is why the rod of Aaron was in the Ark of the Covenant, do you see? The Blessed Eucharist comes to us in two ways, as Sacrament and as Holy Communion. Saint Augustine says that God became man so that man might become God. The purpose of the Blessed Eucharist in sacrament is the divinization of man. The action which makes the Blessed Eucharist a sacrament is Its entrance into your mouth and the making of the little journey down into your body. That little gulp is a gulp of God! The easiest, most natural thing a man does is going to be the most tremendous in effect for him. The first thing a baby knows, is how to eat. If the time comes when doctors have to teach babies how to eat, that will be the end of all children. We may have to teach a child to clap its hands, move its feet, look at the moon — but never to eat! Usually the baby reminds the doctor that he wants to eat, and not the other way round. If you want to know what the baby is crying about, you may be sure it is not for lack of a nursery story or nice music. It is for lack of food! That is one thing we all very well know. Now, here comes the great mystery. I know I touched on this in my talk last week, but since, this week, I am speaking about the Real Presence and Holy Communion both as prefigured in the Old Testament and fulfilled in the New, it is no harm, I think, to repeat myself for a few minutes. Here is the mystery: When the species of bread and wine are destroyed, what happens to Jesus? Where does He go? Does He leave us? He is no longer there as sacrament. You know that, because Jesus without the species is not in sacrament. Is He absorbed into us, as is our other food? No, He is not. We are absorbed into Him! How? Corporeally and humanly. From now on begins our union with His human nature. There also begins our union with one another. When I go to the altar and receive the Blessed Eucharist, I do not receive my loved ones also. I receive only Jesus. My union with Jesus Christ in the Blessed Eucharist does not make me united with another human being unless he is also incorporated with Jesus in the Blessed Eucharist. Two things incorporated with an identical third, are incorporated with each other. All other foods which we eat, we assimilate — we absorb into ourselves — because we are greater than they are. This Food, however, assimilates us, because we are less than It — infinitely less than It. The Food assimilates the eater, in this sublime performance, because the Food is greater than the eater. The more assimilable we are, the more completely are we taken into Jesus, in Holy Communion. The more Christ-like we are, in our actions, in our efforts, our ways, our habits, the more we have prepared ourselves for the reception of Him. If we are meek and lowly, we are easily brought into the fibers of His flesh and blood and heart. We are both humanized and divinized in the Blessed Sacrament and Holy Communion. The Blessed Sacrament divinizes us, and Holy Communion humanizes us according to the pattern of Jesus Christ. And Holy Communion Mary-izes us, also, because the humanity of Jesus is what He received entirely from His Mother. How far does this humanization of us go? There is no measure as to how intense and one that Communion can be. It can be so one — Jesus’ assimilation of you can be so complete — that you can look like Jesus, feel like Jesus, talk like Jesus, suffer like Jesus. His interests become your interests! Some of the saints even take over from the intensity of the Holy Communion union that which their love has most brooded over — the holes of the nails in His hands and feet, the wound in His side. They receive the Stigmata. It is part of the innocent overture to the world that real saints make. Saint John of the Cross was so intense in his love for Christ that when he suffered pain, he worried most about the fact that Jesus was suffering pain. His own pain did not seem to bother him. In Holy Communion, your body belongs much more to Jesus Christ than to you. “I live, now not I; but Christ liveth in me,” Saint Paul said. (Gal. 2:20.) I have read to you many times the sixth chapter of Saint John, in which he stresses this with all the intensity possible. The Doctors of the Church had no hesitancy in emphasizing it. Nourishment is not nourishment unless it be assimilated: unless the food and he who receives it form but one living body. “My Flesh is food indeed, and My Blood is drink indeed,” Jesus said. No one could possibly say that Christ, the Author of Life, could ever be absorbed into His creatures, as food! We, the weaker element, could never absorb Jesus, the stronger; Jesus, Who is God! Saint Cyril of Alexandria says that it is only the senseless one, with his usual cowardice, who says that we are not by our body united with Christ, and in Him with each other, through Holy Communion. Somatophobia is the curse of our day! The way the moderns treat the body, deal with it, biologize it, chemicalize it, psychoanalyze it, is proof they have no respect for it. And if you have not divine respect for that which is as close to you as your hands, your ears, your eyes, the body you must bring upstairs and put to bed, that bears the heat of the day, how can you possibly get into salvation? Christianity is a concorporeal spiritual life! The same cowards who make the Church an invisible society, have tried to make the Blessed Eucharist a purely spiritual communion, with nothing to do with our body. The priest says in the Mass: “Corpus tuum, Domine, quod sumpsi, et Sanguis quem potavi, adhaereat visceribus meis . . .”— “May Thy Body, O Lord, which I have received, and Thy Blood which I have drunk, cleave unto my entrails . . . .” May we be formed and fashioned out of the same substance, concorporeally united, so that we may become other Christs. Our bodies are made so sacred, because of the Eucharistic union with Christ, that even when we die, our very relics are precious. Catholic dead bodies are precious things. They are carried into church, and placed at the foot of the altar. The priest blesses them, says special prayers over them, while the Holy Sacrifice of the Mass is offered for the repose of the souls which once animated them. They are the temples where the Body and Blood of Jesus dwelt. I might almost say that the Holy Communion effect of the Blessed Eucharist is the one we understand most of all. At night, we have to leave the Real Presence when the pastor says it is time to go home and the sexton closes and locks the door. In the morning, when the Mass is over, the Holy Sacrifice is finished, and there will not be another Mass until the next morning. The Blessed Sacrament effect, as far as we can see the result, is short, because the sacramental effect is not for our delight. It is for God’s delight in us. The Blessed Sacrament in us, in divinization, is so that God can look, the saints applaud, and Our Blessed Lady watch. While it is true that the stars are vestiges of God — in us, after we have received the Blessed Sacrament, God sees something far brighter than His stars. He sees His own Being shining back at Him. Imagine God looking into His own eyes! “Everything the Father gave Me, I shall give you,” Jesus said at the Last Supper, when He talked about this Sacrament — this Sacrament which Liberal Catholic priests are not talking about, and which Protestants are snubbing. “Everything the Father gave Me, I shall give you.” My eternal awareness of all joy and beauty, you shall have. If this is not Christianity, then all the saints have been defrauded by God. There is no Christianity without this Reality of all Realities! All the patient preparation for it! All the Ark of the Covenant carrying, all the wanderings toward the Promised Land, all the manna in the desert! What blasphemy, that we do not fight for It in our day! We have no other purpose but to fight for this Bread of Life, for which we should be ready to shed our blood. How was Saint Matthew killed? As he was saying Mass. That is the way for us priests to die — instead of in automobile accidents! We priests are not supposed to be the comfort, in the wrong way, to the people. We are supposed to be a challenge, and a lightning bolt of love — a lightning bolt that will shock the world into realization. “Except you eat the flesh of the Son of man, and drink his blood, you shall not have life in you . . . He that eateth my flesh, and drinketh my blood, hath everlasting life:. and I will raise him up in the last day . . . He that eateth my flesh, and drinketh my blood, abideth in me, and I in him . . . This is the bread that came down from heaven. Not as your fathers did eat manna, and are dead. He that eateth this bread, shall live forever.” (John 6:54-59.) Either accept this, or you will not be saved! The Holy Communion effect of the Blessed Eucharist is our union with the human nature of Christ. In the Blessed Sacrament we become God the Father’s son, and in Holy Communion we become Mary’s child. Every holy person looks like Jesus. When it is said that we should see Christ in the eyes of our neighbor, that statement is not make-believe. It is not uttered just for the nice sound of it. It is said because Christ is there, in our neighbor, if our neighbor is receiving the Blessed Eucharist. And Christ is not there, if our neighbor is not receiving the Blessed Eucharist. “Unless you eat My Flesh and drink My Blood, you shall not have life in you.” Without the Blessed Eucharist, you cannot be saved. If you do not receive the Blessed Eucharist, you do not have Christ in you at all. You are as barren as the Holy of Holies when the Ark of the Covenant was lost in Mount Nebo. The Ark of the Covenant was secretly removed from the Temple by the prophet Jeremias, before the Babylonians plundered the Temple and took the Jews off to captivity, in the year 587 B.C. Jeremias hid the Ark on the mount where Moses was buried. He hid it in a cave, which he carefully sealed. He did not mark the cave, and when the Jews returned later for the Ark, they could not find it. To this day, it has not been found. The Tables of the Law were gone. Why? Because the fullness of time was approaching. The presence of stone was waiting for the presence of the Bones of God! The manna that had perished each night was waiting for the Manna that perishes each day within the temples of our bodies! The Blessed Sacrament effect, then, is to make us fascinating to God. The Holy Communion effect is to make God fascinating to us! You ask, why do we go to Communion again, if we have gone once? Somehow, because it is food — though It is very little food quantitatively — It keeps a similarity with food, with bread. It follows the rule of food, and we partake of it daily. It is our daily Bread. We refurbish our union with Jesus in this marvelous assimilative exchange. Were we to receive the Blessed Eucharist once, and were that enough for a lifetime, we would, I assure you, quickly forget that we ever had been united with It as food. That does not happen if every day It is our Food of all foods. Think of the charity of the Blessed Eucharist as Food — so sweet and gentle and frail — light enough not to be an encumbrance to our other food, or a hardship to it, inconspicuous by way of bulk, taking the minor place of the things we consume, mingling with our meat, and water and bread! To say that the Body, Blood, Soul and Divinity of Jesus Christ moves in with the water and the bread and the milk and the honey that we consume and is delighted to be part of an assimilative arrangement, in which Jesus will prevail on His own terms, is to make the Blessed Eucharist most precious in utmost performance! We are closer to It than to anything else I can think of! Now, there may be something lacking in my heart in its appreciation of the Sacrifice of the Mass as a sacrifice to God. There may be distractions in my mind which make me forget the Real Presence, so that I may not be constantly kneeling before the tabernacle. There is something transient, quickly passing, in the Blessed Sacrament, that when the eating is finished, I might forget It. But, by reason of Holy Communion, I know at every moment that Jesus and I are still one, that where I go now, He goes, that whoever hurts me, hurts Him, whoever loves me, loves Him. I know that wherever I am I can speak His Divine message. I know that I am almost a little vicarious presence and sacrifice all in one, by reason of my Communion with Jesus. I am one flesh and blood with Him. Man cannot approach or realize God in better terms than that. Man is an incarnational animal. If you do not give him something down to the depths of his body and his soul, you do not touch him. Our Blessed Lord is constrained to say: “Who eateth My Flesh and drinketh My Blood, liveth in Me and I in him.” He did not say: “Who consumes My Spirit will be united to the Infinity of Me.” The reason He did not say this is not because it is not so, but because He knew that if He found a loving human heart, it would have to start its long journey to Him on human terms. Its first steps would have to be human. When you are equalized with Jesus through the nature which you and He have in common, then the Divine Person is with you by reason of that nature. And that to my mind is the big feature of the Blessed Eucharist that has been lost. That loss, to my mind, is the explanation for all the indefinite, vague talk about the Mystical Body of Christ. Incorporation into the human nature of Jesus Christ through the reception of the Blessed Eucharist makes us members of the Mystical Body of Christ, or else I do not know the meaning of the term. I do not know why we call it the Mystical Body of Christ, if that is not so! Blood of Christ, fill all my veins; . . . In His revelations to Saint Margaret Mary, the Sacred Heart was referring chiefly and uniquely to Himself in the Blessed Eucharist. 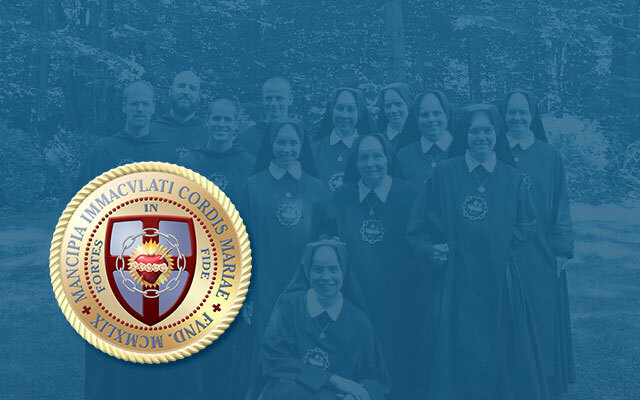 Our Lord knew that those who had taken His Body and Blood into their mouths — into their being — had not been conscious through Faith of the great heartbeat of Incarnational love for them in His Sacred Heart. It is not the Sacred Heart imagined, that Jesus wants of us, but the Sacred Heart realized: the Sacred Heart realized by concorporeal union with Him. Two hearts in one human breast, and one heart entirely unmindful of the Other, is the hardship that the Sacred Heart has to bear. Jesus Christ said, “I am the Way, the Truth and the Life.” He did not say, “My direction is the way.” He said, pointing to His own breast, “I am the Way.” Imagine knowing that, and being interested in any way or truth or life that is not Jesus! And imagine that same Jesus — the Way, the Truth and the Life — entering your door, coming through the portals of your lips into your heart and abiding physically there, tabernacled in your breast — and your having any other interest in the world before Him! Jesus is the Way, the Truth and the Life! He is the Book, the Subject and the Teacher! Jesus is not merely my Lord and my God. He is my God and my all! Do you think there is a single person in the world who does not know that in Christianity the main mystery, the central reality, the challenge of all challenges — the dynamite doctrine of all — is the eating of the Body and Blood of Christ? Do you think anybody could be constructed as a man with the kind of temperament and interests a man has — and not be engrossed in that more than in anything else? Do you think Catholicism’s sociological challenge, its liturgical challenge, or art challenge, or political challenge, could be equal to the challenge of this great Bread, which is God’s Body and Blood, and which we call the Bread of Life? You may say that many people do not know about the Blessed Eucharist. I answer: It is our obligation to tell them! The Blessed Eucharist is supposed to be like a city set on a hill. It is supposed to be the light of the world, the salt of the earth. It is the Light of the World, the Salt of the Earth! Everything you get from a Catholic should be salted with that interest. Everything you see in a Catholic’s eyes should shine with that light. I am now going to say a simple, strong and clear thing about the Blessed Eucharist. I think that Baptism makes you the son of God. I do not think it makes you the child of Mary. I think that the Holy Eucharist makes you a child of Mary. Baptism, being from the merits of Christ who was the Child of Mary, you get through the co-redemptive merits of Mary, by her motherly adoption of you. You also get it from her as Intercessor, as Mediatrix of All Graces. Without her there would be no Christ to institute Baptism to remit original sin. She is, therefore, the Mediatrix, the remote reason for our having Baptism. But when you speak of a mother as a “remote reason” you know you have not got a mother at hand. Our Lady is the Queen of Baptism. But she is the Mother of the Eucharist. What happens to those children who die between Baptism and Holy Eucharist? They are in the state of grace, which state of grace has been won for them by the Flesh and Blood of Jesus in suffering in union with the Divine nature of the Word. It has been won for them out of the treasury of suffering of Jesus and Mary. Baptism has taken these little children out of original sin and restored them to divine sonship, lost through Adam’s sin. They go to the Beatific Vision. They are of the kingdom of Mary; but they are not the children of Mary. Mary is their Queen, but not their Mother. They are like little angels. There was a strong tradition in the Church that always spoke of them as “those angels who died in infancy.” They have the Beatific Vision, and they see the great Queen, but they do not move in as part of the Mystical Body of Christ in the quintessence of that beautiful word. Baptism is the preparation and the liturgy. It is the inchoative Eucharist — the beginning, the preparation for the Holy Eucharist. Baptism has as its purpose to make us sons of God — so that we can be incorporated with Jesus in the Holy Eucharist, and become the children of Mary’s womb! And so I say: If a child dies after having received Baptism, he dies as the son of God, but not yet as the child of Mary. When he gets his body back, at the end of the world, he has to drink of the Chalice in the Kingdom of his Father in order to be incorporated in flesh and blood with Jesus — and so become Mary’s child. There is no other way! But is it not beautiful? This is chastity: to keep central things central, to keep the Holy of Holies holy. The one central thing in the temple of the Jews was the Holy of Holies. The courts outside it had significance and meaning because the central thing was kept sacrosanct. Into the Holy of Holies, the High Priest went but once a year. He was the only one who could enter in. The faithful remained outside, watching. We have a Holy of Holies far more sacred than that of the Jews. And when a priest walks into the sanctuary of our Holy of Holies, there should be no other interest in his heart or in his thoughts except that Blessed Eucharist. Our Bread of Life looks like the frailest little thing in the world. The Host is the least like stone that anything could possibly be. It is the most perishable little substance. Each morning it has to be renewed. But it is infinitely more abiding than the stones in the Ark of the Covenant — as long as the words of Jesus Christ are spoken, as long as there are priests somewhere in the world. The Blessed Eucharist will never be lost, as were the Tablets of stone in the Ark of the Covenant. You can lose the Faith, if you are a priest, but another priest will come — there will be another altar, another vineyard, another wheat field. The Sacrifice of the Mass will always be in the world, from the rising of the sun to its going down. We have not just one Ark of the Covenant. We have thousands and thousands of tabernacles, housing that little Frailty, whose whiteness and roundness are now the wrappings of the Flesh and Blood of God, once structured in Nazareth out of the pure substance of Mary’s body. Jesus in the Blessed Eucharist is the Gift of God, and of her who for nine months was the tabernacle of God. The Blessed Eucharist will never be lost. Jesus visibly said only one Mass. He forgave only a few sins directly. But His priests fill the confessionals and the sanctuaries of the world with absolving and with consecrating hands.